We all need some time to relax and get away from everyday troubles and worries. Traveling is undoubtedly one of the best ways to escape from the routine of daily life. What can be more calming and relaxing than a weekend spent somewhere quiet in nature? It seems that there is a new innovation that could interest the lovers of quiet getaways, as well as off-grid enthusiasts. A new innovative design called Floatwing allows you to enjoy a perfect off-grid getaway! Floatwing is essentially a floating mobile home which can move at a speed of 3 kt (3.5 mph / 5.6 km/h) using two small outboard motors. It has been designed using a modular design so it can be built to individual specifications from 7 to 15 meters in length. Created by the Portuguese engineering company Friday, this amazing self-sufficient home is aimed to achieve maximum energy efficiency by using environmentally friendly materials and taking advantage of green energy. Thanks to this, the Floatwing has a very low carbon footprint and covers 85% of its energy needs through renewable sources, mainly solar power. In fact, it can generate up to 100% of its annual energy demand in just six months. When fully charged, the watercraft is completely self-sufficient for at least seven days, including the energy needed to power the onboard appliances. No word yet as to how the Floatwing will perform in non-perfect conditions but it’s safe to assume sea crossings will be out of the question! Given the Government’s current strategy to reduce in feed-in tariffs, the performance of solar installations will come under even greater scrutiny, with any reduction in yield potentially having a significant impact on a solar installation’s financial viability. However, Nsure have a solution to protect developers and operators against the risk of system under performance. It’s a simple policy for solar owners and operators that are concerned about system under performance. It will help owners and operators to manage the downside of poor solar performance by helping to improve the financial stability of a project and can be arranged as a stand alone cover or as part of an insurance portfolio. The policy will make up for lost revenue due to system under performance and the policy can name the bank or financial backer as the loss payee for payment of claims. •Nsure currently has over 220 UK sites benefitting from Solar Protect and cover can be arranged in the UK and Europe. Whether you have an existing portfolio of solar parks or are in the throes of construction, it may well pay to discuss the benefits of Solar Protect. Nsure Renewables are specialist independent, Chartered Insurance Brokers who have arranged insurance for the renewable energy industry for over 20 years. Every window… Every screen, a power source? In 2010 a team of engineers in Massachusetts Institute of Technology’s (MIT) Organic and Nanostructured Electronics laboratory began work on a ground breaking technology that allowed any sheet of glass to become a transparent solar cell. Richard Lunt, then an MIT post doctorate, suggested that it was possible to create a solar cell that would absorb all the energy from the sun except that part which allows us to see. How can you create a solar cell that you can see through? The theory went that as follows; all light is made up of electromagnetic radiation which spans a spectrum of wavelengths. Each of these contain energy that can be collected by the solar cell, but as good as the human eye is, it can only detect a fraction of the spectrum – visible light. By developing the cell to only allow that visible light through, the ultraviolet and infrared would be captured and we’d never notice! But it didn’t really work did it? Well, yes it did. But unfortunately a major stumbling block was the energy conversion rate, which was very low – around 2% – but at the time the team’s cells transmitted more than 70% of visible light, which is very similar to the tinted windows currently used in many tall buildings. Is it scalable and can the efficiency rise? Fast forward to 2015 and the latest transparent glass sheet cells are growing in size. A detailed theoretical study back in 2013 showed that efficiency should rise to 12% once the glass is in production, a rating similar to current commercial solar panels and during a demonstration two years ago the solar cells powered the LCD display on a small alarm clock. Already the transmitted light has improved to over 90%, and better production methods have started to increase the efficiencies. One of the biggest barriers however is longevity. In a commercial application such as windows, the cells would need to perform for many decades. The team at Ubiquitous Energy – the company created by the researchers at MIT – believe that in time, with many companies striving to meet the same goals, this issue will be solved and the solar cells will become commercially viable. 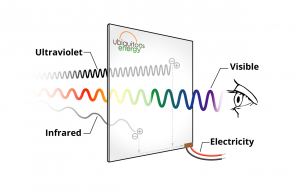 Ubiquitous Energy have recently won the 2015 Display Week innovation award for their work into Transparent Photovoltaic Energy products and debuted the Clearview Power™ technology at Display Week 2015, the Society for Information Display International exhibition in San Jose. Their website can be found here http://ubiquitous.energy/. In time to come, the windows in your home may be able to create enough electricity to run your television, or your fridge. Offices might be able to harness the power of the sun, enhancing building efficiency in our cities without unsightly solar panels and reducing our reliance on traditional methods of energy production. Even your smartphone may benefit from solar cells – running out of battery in the middle of that important phone call or web browsing session may just become a thing of the past. On Thursday 2 July I drove to Stanmer Park just outside Brighton to visit the Brighton Earthship, arranged by the Sustainable Business Network on behalf of the University of Brighton’s Green Growth Platform. Along with 10 other guests we met our lovely guide Jane Glenzinsko at 9.30 and trekked somewhat breathlessly up a track for 10 minutes to the site of the Earthship. After a tour of the inside and outside of the construction Jane provided a detailed history and explanation of the project. Earthships have evolved over the last thirty years from the pioneering work of Michael Reynolds, Earthship Biotecture and the residents of the 3 Earthship communities in Taos, New Mexico. Earthships are ‘green’ buildings, constructed using waste car tyres and other recycled materials. They use the planets natural systems to provide all utilities – using the sun’s energy and rain to provide heat, power and water. They are buildings that heat and cool themselves, harvest their own water and use plants to treat their sewage. The basic building block of the earthship walls are used car tyres. The UK throws away over 48 million of these annually and they are now banned from landfill. The preparation method is quite simple. Line the tyre with cardboard, fill it with earth and ram the earth down with a sledge hammer until the tyre is fully inflated. All tyres are worked on in-situ, being pounded a course at a time and together with a 1m of rammed earth behind them they create thick walls of thermal mass. Finally the tyres are rendered over with mud, adobe or cement. Another waste material used in the earthship are glass bottles, which are cut up and taped together to form glass bricks. The glass bricks are then laid in courses in cement to form a wall, which are finally rendered over and look like stained glass. The hall floor is made from reclaimed granite and marble off-cuts from a local monumental mason in Brighton. The sun provides heating by using a dynamic combination of solar gain, thermal mass and super insulation. The walls act as a storage heater. Behind the tyres and earth is the thermal wrap or insulation blanket that separates the mass from the earth that is sheltering the building. The structure is orientated towards the south, which maximizes the opportunity for solar gain. The front glass windows are angled to allow for maximum sunlight during the winter months when it is most needed, but reflects it during the summer months when the sun is higher in the sky. The heat from the sun is stored in the thick walls and is slowly released during the night and colder days and seasons – the same as the heat you can feel emanating from a stone wall in summer after a sunny day. The size of the thermal store enables heat to be stored inter-seasonally over a long time. The earthship also generates 20kw from 4 renewable technologies – photo-voltaic panels and a wind turbine for electricity; and solar thermal panels and a wood pellet stove for water heating. The earthship is zero carbon and there are no utility bills. Earthship Brighton harvests all the water it needs from the sky. All rain water is collected, used and treated on site, saving on infrastructure investment and not depleting the overstretched ground water in the drought stricken south-east of England. The area of the roof coupled with the average annual rainfall for Stanmer Park means that it can harvest around fifty thousand litres (50m3) of water per year. The rainwater flows from the roof through two filters, including a vortex filter, into four underground water tanks. There is enough room to store twenty thousand litres of water, which is enough to supply the earthship for two to three months. This was a thought provoking and entertaining tour and presentation – a visit is thoroughly recommended. Living in close proximity to the village of Balcombe, West Sussex, our senior account manager David Elliot-Rose is well aware of the fracking issues over the past couple of years – so with all the previous negative publicity it is pleasing to see some positive renewable energy news. Some of the villagers in Balcombe in Sussex have scaled up their plans for a solar farm that has already begun generating electricity. If successful the community-owned farm could generate enough power for themselves but also the neighbouring village of West Hoathly. Renewable energy cooperative REPOWERBalcombe was established by residents as a positive way to unite with renewable, locally-owned power, after the controversy over oil drilling by fracking firm Cuadrilla in the 2013 summer. After a successful share offer earlier this year, solar rigs are soon to be installed on the roofs of two local schools. This follows a pilot in late 2014, where 69 panels were installed on a cowshed at a nearby farm. The investment for the solar installations at Grange Farm and the primary schools came entirely from local people. Costa Rica managed to do without electricity from Fossil fuels for the first 75 days of 2015, the state-run Costa Rican Electricity Institute (ICE) announced last month. Above average rainfall has enabled Costa Rica’s hydroelectricity power stations to supply the bulk of the electricity required by the country (68%), with Geothermal plants providing about 15%, wind power 5% and the rest made up from Solar and Biomass. In 2009 Costa Rica announced its goal of becoming carbon-neutral by 2021 – and with 88% of its energy requirements being fulfilled by renewable energy already, this doesn’t seem far-fetched. Costa Rica’s Legislative Assembly approved a geothermal project last year valued at $958m, which the Japanese International Cooperation Agency and the European Investment Bank are helping to pay for, and in 2012 ICE announced projects to develop 100 MW worth of wind farms and 40 MW of hydroelectric plants during 2015. Costa Rica leads the way on other environmental protection and conservation issues too, in 2010 the country was awarded the Future Policy Award for policies that use funds from fees and taxes to preserve natural spaces. Costa Rica also remunerates landowners to plant trees and not cut down existing forests – helping to expand forest coverage from 24% in 1985 to 46% in 2010. Of course, all this infrastructure requires funding, and since Costa Rica abolished its military in 1948, funds have been available for matters closer to home, such as Education, Healthcare and the environment. The biggest barrier to becoming carbon neutral as a nation will be the switch for things that don’t run on electricity, such as transportation – but, according to Monica Araya, of Costa Rican think tank Nivela, it can be done – and with the government leading the way, and a 12% reduction in consumer energy costs from using renewable energy for their electricity – you can understand her conviction. Swiss pilots Betrand Piccard and Andre Borschberg are hoping to write themselves into the history books with the first solar powered, all electric flight around the world which took off from Abu Dhabi this week. Over the next five months the zero emissions aircraft will fly through Oman, India and China, where it will then cross the Pacific ocean and call in at Hawaii and the USA before crossing the Atlantic into Europe or North Africa before finally landing back in Abu Dhabi. Solar Impulse weighs just 2,300Kg and has a 72 metre wingspan, some 3.5 metres longer than the latest Boeing 747-8I. It has a speed range of 20kts (22mph) to 77kts (47mph) and is made of very light carbon fibre. Whilst it has the potential to fly non-stop it is limited by human endurance abilities, and can carry a single pilot and no passengers. As an electrically powered aircraft, using only energy stored from its solar panels it has zero emissions – 0g of CO2 per Kilometre. As a comparison, a 747-8I has a maximum take-off weight of 448,000Kg and has a cruising speed of Mach 0.855 (570mph at 35,000ft). It has a range of 9,210 miles with 467 passengers and baggage. The B747-8 is one of the greenest aircraft manufactured today and produces approximately 35Kg of CO2 per Kilometre*. On this epic trip round the world, the pilots are only able to take naps lasting 20 minutes every two to four hours, and are using specially developed light emitting glasses to help them sleep. The lights are programmed to flash in very precise patterns to send the pilot into a deep sleep very quickly, and bring them out very quickly too. Another difficulty is the size of the aircraft. In order to save weight the pilots are restricted to their chair, which acts as a seat, bed and toilet throughout the flights, which will last up to 5 or 6 days and nights in a row on the “long-haul” legs of the trip. In order to save weight the cockpit is unpressurised and unheated, although the cockpit structure does employ high density thermal insulation. At the time of writing the aircraft had recently landed in Ahmedabad having covered the 1,465Km from Oman in 16 hours. It’s safe to say that Solar Impulse is uncomfortable, impractical and slow – but with huge potential for increasing global awareness of solar energy and showcasing the cutting edge technology involved in this 12 year-in-the-making adventure, the Solar-Impulse team will be hoping their pioneering flight is a success. *Based on 100% load. And if you think 75g per passenger kilometre is a lot, the greenest 1.4L TSI VWs produce upwards of 85g per kilometre. Our client Shane Cadzow writes………..
Around 15th October 2014 when the service Engineer was making a blade inspection as part of the normal servicing, he noticed that part of the trailing edge of one blade had opened up, this was at closer inspection to have been caused by a lightning strike, presumably from a storm that had come through the previous August. This was reported to our broker, Nsure Renewables, on 16th October and an insurer appointed loss adjuster was in touch with us within a few days thereafter. Following further conversations with NSure it was agreed that we could proceed and look for a suitable company to come and repair the damage. Fortunately there was a gap in the wind strength in the first week in November and we managed to get B9 Energy to agree to come straight away. However as they are based in the south of England this cost a further day and finding a mobile elevating work platform small and light enough for our Luing ferry meant another trip up from the south. Nevertheless all went according to plan, the B9 folk stayed on the Island 3rd, 4th and 5th November and we were delighted that the job was carried out within the weather window available. Following the works, Nsure assisted us in presenting the invoices and a satisfactory settlement was agreed. Full payment was received for repairs and consequent lost revenue from our insurers in January 2015. If you live in Portland, USA, your lights may now be partly powered by your drinking water. An ingenious new system captures energy as water flows through the city’s pipes, creating hydropower without the negative environmental effects of something like a dam. As every Autumn draws to a close, it heralds the three day RenewableUK exhibition, which this year took place at the Manchester exhibition centre. After suffering the cancellation of their intended Virgin train from Euston (great start) David Elliot-Rose and Dave Cole went straight to the exhibition hall from Manchester Piccadilly station whereupon the Nsure exhibition stand was set up without incident. Monday evening was a reserved affair – following unpacking at their hotel David and Dave set off to explore the restaurant selection of Manchester, soon locating Chinatown and enjoying an excellent Thai meal.